The rumors are indeed true: Borderlands 2’s very first downloadable expansion will be out next week. Borderlands 2: Captain Scarlett and Her Pirate’s Booty is the first of four planned expansions, and it’ll be out on Tuesday, October 16th. Season pass holders get the pack for free, while it’ll set other players back a cool $10. As you can gather from the title, the DLC does involve a lady pirate. 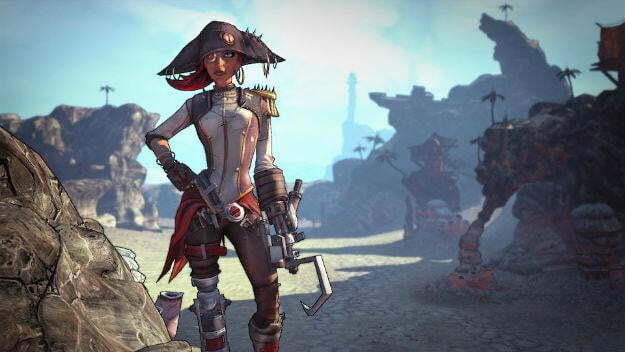 As is appropriate for Borderlands, she is actually a desert pirate though, and you sail the sandy dune seas of Oasis across her approximately 8-hour adventure. Digital Trends has already enjoyed an ample sample of the DLC but our preview won’t run until Monday morning. Check back then for a look at the pleasures of Sand Skiff driving, water questing, and bantering with pirates.